As part of the Review Crew for the Old Schoolhouse, I was selected to review Memoria Press and their First Start Reading program with Charlotte (age 4 1/2). First Start Reading is a classical curriculum to teach your pre to early elementary aged child Reading, Printing, and Phonics. Charlotte is beginning to read already and is well on her way, so the beginning to these books (we received A, B, C, and D as well as a teacher’s guide) were a bit repetitive, but she loved it nonetheless. I debated jumping her further into it, but her printing could definitely use some help and every day she had the opportunity to practice a few letters at a time so I decided to let her start at the beginning. 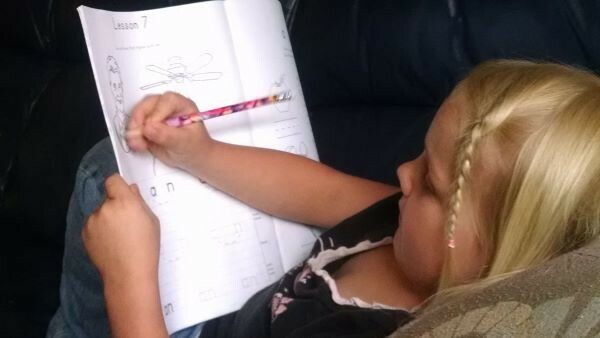 She worked much on how to hold her pencil and how to form her letters – both much needed. Somehow we’ve plowed ahead into reading without properly learning writing. Charlotte worked methodically a lesson at a time usually three, sometimes four days a week, and while I thought she’d want to speed ahead, one lesson (two pages) was enough for her. I have already seen improvement with her letters filling the lines and staying in the proper spaces since we started. 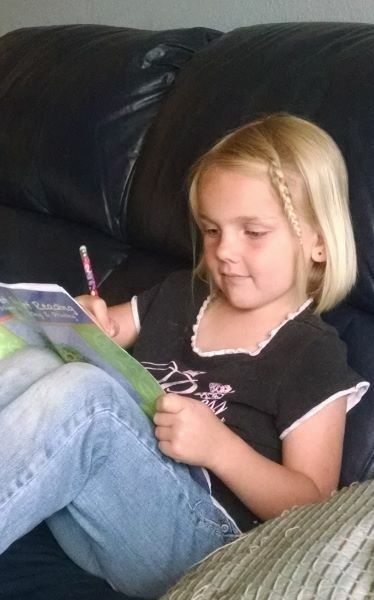 She loves having school to do, it’s required about ten minutes a day for instruction from me since Charlotte is a quick learner and not brand new at this, and then she heads off to do her pages – and she’s learning. For a non-reader or new reader, it’s perfect. Each of Charlotte’s four workbooks have 75-100 pages in them. The teacher’s manual leaves the teacher well equipped to teach with 322 pages – with no prep work ahead of time. By the time Charlotte finishes Book D she will be reading short and long vowel shorter words, practicing consonant blends, and 45 common words. She typically colors a bit, practices putting letters together into words, and is reading short vowel words right now. She draws pictures often and loves that best. Looking back at the photo I uploaded, she learned “a” vs. “an” with words that begin with vowels that day. At first she was confused and then suddenly she got it – and so did my three year old Pierce! It was a fun moment, watching the light come on and realize the things that she says without even realizing it. We’ve had a lot of those moments lately. By the way, it didn’t require the consonant/vowel explanation, but she’s heard these terms before so I went into it. I loved how it left things like that up to me and didn’t make it more confusing than it needs to if she hadn’t been ready for that. I particularly appreciate the assessments that check to see if she is ready to move forward or needs more repetition to master the skills she’s been practicing. As a homeschool parent that second guesses skills more often than I ought, it is particularly helpful to me when I can know right where she should be, is, and what she should move on to next. I found First Start Reading to move at a great pace, even when it was repeating what she already knows. Charlotte enjoyed herself mostly – I think I made her a bit frustrated when I picked on her handwriting. She decided quite a while that she wanted to learn to read, so I taught her, but about the second time I made her practice when she didn’t ask for it, she decided she didn’t want it anymore. She’s hitting the age that she is going to have to do it, like it or not, but she balked slightly with this… and everything these days. The early lessons especially built confidence in Charlotte – I think that is a big part of her hesitation, so this was great for her. First Start Reading set is $42.95 available here. For a second child (without the teacher’s manual) it is priced at $28.00. I will stress – the teacher’s book is pretty vital. Some early elementary stuff can get away without it – but this isn’t one I’d choose to do that with. Memoria Press is on Facebook, Twitter, Instagram, Pinterest, and Google +. More reviews from Memoria Press can be found on the Review Crew Blog on both First Start Reading and a cursive curriculum that looked equally exciting. Check them out! ← I don’t care. Wait, I do.